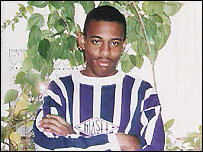 Claims that the first police probe into the murder of black 18-year-old Stephen Lawrence was hindered by a corrupt officer are unfounded, a watchdog says. It was claimed in a BBC programme in July 2006 that detective sergeant John Davidson took a bribe from Clifford Norris, father of suspect David Norris. The Independent Police Complaints Commission investigated the claims over the 1993 murder, in south-east London. The BBC was criticised by the police, but said it stood by the journalism. Stephen was murdered at a bus stop in Eltham in April 1993. His family made a formal complaint after the allegations were broadcast in a documentary called The Boys Who Killed Stephen Lawrence. Senior IPCC investigator John Cummins delivered the findings of the year-long inquiry by hand to Stephen's parents, Neville and Doreen Lawrence. He said they had expressed frustration and disappointment and wanted justice for their son. The programme featured an interview with disgraced former detective Neil Putnam, who turned informant on his colleagues after being arrested for corruption in 1998. He claimed he told officers Mr Davidson, who is retired, once said Mr Norris was "a good little earner". But IPCC officials found no evidence that this was the case. They said there might have been confusion between Clifford Norris's son and another David Norris who had been an informant and was murdered in 1991. The documentary also suggested the Metropolitan Police failed to advise the Stephen Lawrence Inquiry of concerns regarding Mr Davidson, who acted as a witness. The IPCC found there was no evidence of information being held back. Rebecca Marsh, an IPCC commissioner, said now the rumours surrounding the investigation had been laid to rest, it was time for the Metropolitan Police to bring Stephen's killers to justice. The Metropolitan Police said it had been disappointed with the quality, approach and balance of the programme, despite having co-operated fully with the BBC. "The claims were untrue and we told them this was the case," a police spokeswoman said. "We were disappointed that the BBC compounded the issue by choosing to utilise the full weight of their very powerful publicity machinery to inflate disproportionately the importance and value of their findings about alleged corruption." But the BBC insisted the programme had been in the public interest. "The police investigation into the murder of Stephen Lawrence is one of the most high-profile criminal investigations of the last two decades and is of overwhelming public interest," a BBC spokeswoman said. "We considered it our duty to bring these serious allegations before the public and fully respect the response of the police to those allegations." In the 14 years since Stephen was murdered, there has been a botched investigation, failed private prosecution and a public inquiry. A re-investigation of his murder continues.